Practice makes permanent . . . 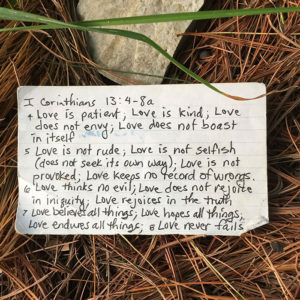 Approximately two years before I began writing DARE To Be Christlike, I wrote the verses of 1 Corinthians 13:4-8 on a now worn 3×5 index card and used it as a tool to keep these attributes of love foremost in my thoughts, prayers, and meditations. I don’t know how many trips this card made with me to New York City, or how many times I prayed over these verses while driving to and from work, but the point is, God put a desire within me to be like His Son. When I realized that the key to becoming Christlike is to walk in love, I took these verses to heart and I invited the Holy Spirit to transform my life by teaching me how to be longsuffering and kind; how not to envy or boast; how to be unselfish, and my two personal favorites: how not to be provoked or keep any record of wrongs. Over the course of these two years, God engineered my circumstances to give me opportunities to apply these truths. As I observed how this message was transforming me, I realized it could also help others. That’s when I began to write—but not before I put it into practice. It is said of Ezra that he “set his heart to study the Law of the Lord, and to do it and to teach his statutes . . .” (Ezra 7:10). This message has been foremost in my thoughts, prayers, and meditations for more than five years. God is still using the message in DARE To Be Christlike to challenge me to be more like Jesus. I invite you to download the free PDF sample of the book and read the first couple of chapters. I’m confident you will want to read more. Copyright © 2019 All Things Christlike. All Rights Reserved. FREE Shipping on every order. Order NOW and get FREE shipping!